Griddled or barbecued plums taste fantastic in this vegetarian main course salad. 1. Preheat the oven to 200°C, gas mark 6. Toss the ciabatta with 1 tbsp of the oil, season and place on a large baking tray. Bake for 8-10 minutes until golden. 2. Meanwhile, whisk the remaining oil, vinegar and honey together, pour over the plums and leave to marinade for 5 minutes. 3. Griddle the plums for 2-3 minutes, turning once, reserving the marinade. 4. Mix together the salad, tomatoes and croutons, toss in the reserved dressing and top with the griddled plums. 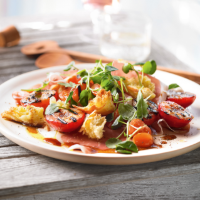 For a non-vegetarian alternative, top the salad with 6 slices (80g pack) proscuitto crudo, torn.